What conditions does Sinemet 10-100 treat? Tell your doctor right away if you have any serious side effects, including: new/worsening movements you can't control/spasms, greatly increased eye blinking/twitching, fainting, vision changes (such as blurred vision, double vision), eye pain, severe stomach/abdominal pain, black/tarry stools, vomit that looks like coffee grounds, mental/mood changes (such as agitation, hallucinations, depression, thoughts of suicide), signs of infection (such as sore throat that doesn't go away), easy bleeding/bruising, unusual tiredness, tingling of the hands/feet, unusual strong urges (such as increased gambling, increased sexual urges). Abruptly stopping or reducing the dose of this medication may rarely cause a very serious condition called neuroleptic malignant syndrome (NMS). Get medical help right away if you have any of the following symptoms: fever, unusual muscle stiffness, severe confusion, sweating, fast/irregular heartbeat, rapid breathing. List Sinemet 10-100 side effects by likelihood and severity. Before using this medication, tell your doctor or pharmacist your medical history, especially of: liver disease, glaucoma, breathing problems (such as asthma), heart disease (such as heart attack, irregular heartbeat), kidney disease, stomach/intestinal ulcer, mental/mood disorders (such as depression, schizophrenia), blood disorders, seizures, sleep disorders. What should I know regarding pregnancy, nursing and administering Sinemet 10-100 to children or the elderly? Does Sinemet 10-100 interact with other medications? Should I avoid certain foods while taking Sinemet 10-100? 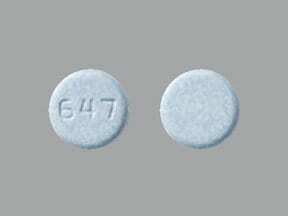 This medicine is a light blue, round, tablet imprinted with "647". 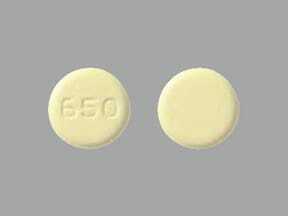 This medicine is a yellow, round, tablet imprinted with "650". 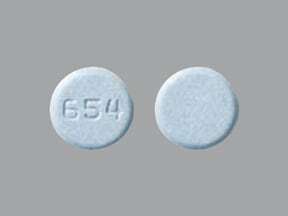 This medicine is a light blue, round, tablet imprinted with "654". Are you taking Sinemet 10-100? Are you considering switching to Sinemet 10-100? How long have you been taking Sinemet 10-100?